Ok, so you've decided to take the seed bead challenge...what next? How about a wonder Kalmbach publication to get you started right. Right-Angle Weave, that is! You might remember that I gave this book a glowing review last month. Well, now you've got a chance to win a copy for yourself or a friend. Oh yippee! I struggle with RAW, so this book would be such a help for me. And with so many great reviews, it looks to be a wonderful resource. Thanks for the giveaway!! I was just looking at a tutorial on brick stitch! Now the right-angle weave is looking interesting!! I keep seeing RAW in books and patterns! Yikes!! too much to learn and too little time to learn it all in!! thanks, Cyndi! Great giveaway! I did a bracelet using RAW but habe not learned the proper way to do this stitch. I would love to learn this stitch better. Looks like a great book - would love to have a copy! Thanks for the opportunity to win this book - RAW is one of my fav stitches! Ooooh I want this book!! Well, RAW is a stitch that I can't say I have mastered yet. I'm in the process of getting acquainted with it, but I love the possibilities this stitch can give you. Lovely giveaway! I love making beaded jewelry and I would love the opportunity to own this book. I love RAW - works up fast and looks so professional!! 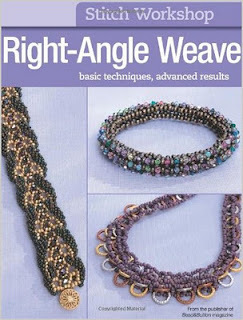 Having never tried a right angle weave, this would be a great book to win!! I love the movement of RAW. It took me many starts and stops to get the hang of it. I printed out many instructions, until I hit on one that stuck. I needed to rebead a belt for a lady because the stitch the belt was done in kept breaking. I knew that RAW was a stronger stitch becasue Carol wells had said so in her book. I would love to have this book in my library please. I've been meaning to learn RAW for a while now, this would be a fantastic tool to help me do it! I've been scratching the surface with RAW, and would love an excuse to really dive in and go wild! Thank you for the opportunity. What a lovely book! looks like a great bunch of projects! Looks like a great book to have! I have been giving this book some thought along with Sabine's new book. Somehow, books are like beads, you can never have to many. Just stumbled upon your blog and now want to learn how to make the beautiful jewelry I've seen! Would love to have the RAW book. RAW was the first stitch I learned. I was intrigued by the notes that said it draped like fabric. I tried a cowl necklace that came out wonderfully! I'm a new beader and would love to have this book!! I would love to own this book, I have pinned it on Pinterest, got repinned almost immediately. Although I've been a seed bead freak for almost 20 years, Right Angle Weave is still quite a new technique for me. This would be a wonderful addition to my collection of books, as well as a wonderful addition to my beading repetoire! RAW is a stitch that I really want to master. I would like to be more proficient at RAW, this looks like a great place to improve my skills! Right Angle Weave is definitely one of my favorites! It would be great to see what is in the book and to learn, which is always fun. Now I am taking part in courses for two months of bead embroidery. later there could be fun to RAW.